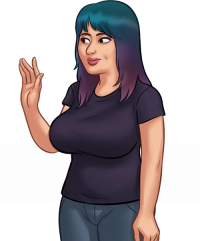 Kass' appearance is a mid‐twenties, chubby woman with purple hair and brown eyes. She is seen wearing a black dress shirt and blue Jeans. Kass works at the Cupid shop inside the mall at the second floor, next to Pink shop.